John Georgelas was born in 1983 in Texas to a proud military family. John was rebellious, experimented with drugs, and exhibited anti-social behavior. But eventually John enrolled at the College Station branch of Blinn College in central Texas. It was there that he met Muslim foreign students and became interested in Islam. In November, 2001, John converted to Islam at a mosque at College Station that was frequented by foreign students. 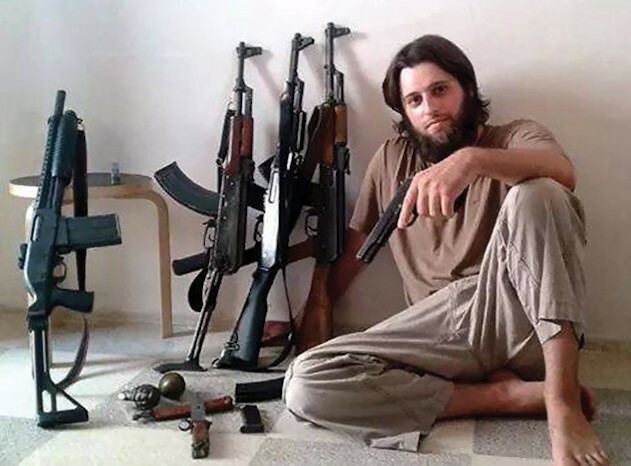 John Georgelas gave himself a Muslim name, Yahya Abu Hassan. Yahya taught himself Arabic and studied the Quran. During the following ten years, Yahya became fluent in Arabic, knowledgeable in the Quran and Hadith, and became radicalized. He declared himself a jihadist and promoted jihadi ideology on the Internet. In 2006, he was arrested for 'Supporting a Pro-Jihad Website' and served 34 months in prison. Yahya eventually married and started a family and in November 2011, he took his wife and children to Cairo, Egypt. Yahya and his family lived in Egypt for two years. In Cairo, Yahya earned money by translating fatwas (Islamic Laws) made by religious scholars in Qatar. Yahya believed in the core ideology of Islam, which includes jihad and enforcing Islamic Law throughout the world. He also believed in the establishment of a Caliphate. In Cairo, he met other jihadists and conducted online seminars promoting a Caliphate. Egypt at that time, in 2011-2012, was ruled by the Muslim Brotherhood. The Muslim Brotherhood were also promoting a Caliphate. But in July 2013, the Muslim Brotherhood were removed from power in Egypt. The Muslim Brotherhood had been encouraging Muslims, both in Egypt and around the world, to go to Syria and fight for Islamic Law and for a Caliphate. Though the Muslim Brotherhood’s endeavors in Egypt had ended, as far as enforcing Islamic Law, the Syrian conflict continued, and there was hope that Islamic Law could be implemented in Syria and that a Caliphate would be established there. Yahya took his family to Turkey in August 2013, just a few weeks after the removal of the Muslim Brotherhood from power in Egypt. From Turkey, he and his family then crossed the border into Syria at an Aleppo border crossing. There he trained for several months with an Islamic State affiliate, then began fighting with ISIS. During fighting, Yahya was severely injured and his injuries were severe enough to prevent him from future fighting. But ISIS leadership recognized his talents in social media and scholarly Islam. So in June 2015, Yahya became an official Islamic State spokesman. By December 2015, Yahya spoke for the Islamic State's al-Bayan radio, the "Voice of the Islamic State". Yahya then became the head producer of high-tech English language propaganda for the Islamic State’s propaganda and recruitment magazines, Dabiq and Rumiyah. In April 2016, Yahya published an article in Dabiq targeting Western Muslims. His title, “Kill the Imams of Kufr [unbelievers] in the West” included photos of cross hairs over photos of well-known Western Muslims. The images also included a blindfolded “apostate” with an executioner’s blade entering his neck. Yahya’s article told stories of what happens when Muslims do not join in jihad and he emphasized that by not joining jihad, western Muslims were Kufr and apostates and deserved having their hands and feet cut off. In later issues of Dabiq, Yahya’s articles focused on Christians and Christianity. He wrote articles titled, “Why We Hate You and Why We Fight You”, and, “We hate you first and foremost because you are disbelievers”. From the beginning, the Islamic State has recruited via high-tech magazines and social media campaigns focusing on a mass movement of Muslims. Via their recruitment and propaganda media, ISIS has been able to quickly mobilize and rise up at new locations when it loses territory elsewhere. The magazines and social media campaigns have also promoted suicide bombings and other terror attacks, for example, using trucks to target large groups of civilians. Yahya promotes jihadist ideology, using Quran and Hadith as sources and support for jihad and terror attacks, but being an American, he also taps into the American Muslim mindset, targeting their weaknesses and vulnerabilities. He knows how to successfully recruit the American Muslim. In August 2016, Abu Muhammad al-Adnani, the Islamic State’s second most powerful leader, was killed in a drone strike. On December 5, 2016, ISIS announced al-Adnani’s successor: Abu al-Hassan al-Muhajir. This is the new name for Texas born, John Georgelas, aka Yahya Abu Hassan. Muhajir is the word for someone who immigrated to the Islamic State and is a foreign fighter. Yahya, now Abu al-Hassan al-Muhajir, has a new name and a new job. A new job that includes “directing overseas attacks”.